I can’t believe we’re halfway through the year. That means I’m also halfway through my verse-a-week challenge, and 6 months into blogging. I hope I will keep getting better at this; I’ve needed the weekly routine of posting my verse, and hopefully in 6 more months it will be an actual habit. I don’t know that I could instantly recall each of the 25 verses I have focused on up to this point, but I do know that through this exercise I’ve noticed Scripture coming to mind faster than in the past. That is worth taking the time to write these posts and create visual reminders for myself. Without the accountability of this blog I would have given up long ago, I’m sure. There is so much to love about this passage. 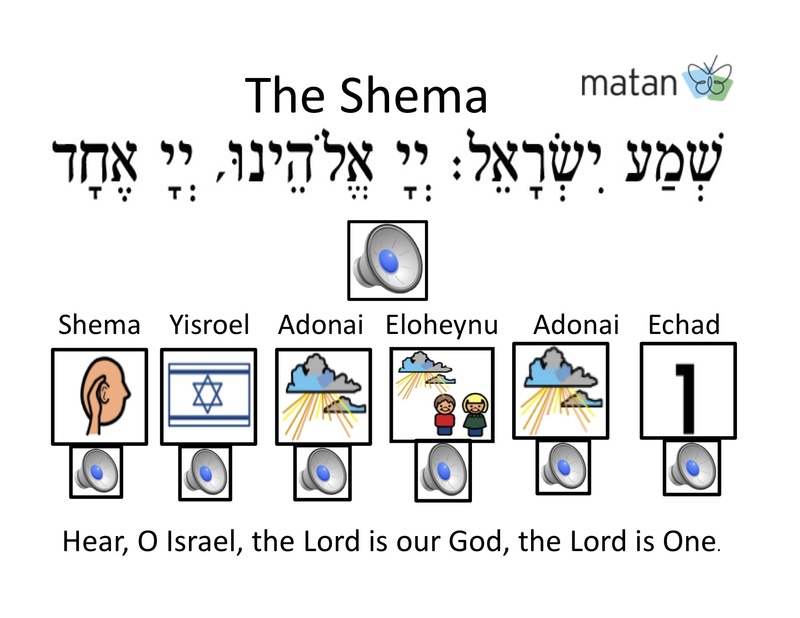 It is known as the Shema (or part of it), and from my understanding is one of the first passages a Jewish child would learn. God’s people have been committing these words to memory for thousands of years, and I think that is so cool! Thank you, Lord, for adopting us Christians into your family. This is a passage for the entire family, with guidance for every part of our lives. In this chapter of Deuteronomy, Moses is in the midst of preparing the Hebrew people to enter the promised land under Joshua’s leadership. He is helping them understand God’s covenant with the people, and how they are to live in light of that covenant. The people needed to hear these words: that the Lord alone was their God, they were to be devoted to him only, they were to internalize his message, teach it to their children, and make it a part of their lives- during every activity, from morning to night. Until we realize we are the same way. Rather than the pagan gods of the Ancient Near East, we are bombarded with temptation to worship at the altars of our own time. They aren’t physical altars that require burnt sacrifices as Baal or Chemosh did (scary), but the ideologies and constructs of our culture do demand our time, our thoughts, our strength, even our very heart and soul. They demand that we turn from God’s call on our lives to serve him and others, and follow the call of Self. This pull toward World and Self is sin, and it is as old as time. The result remains the same: death. God didn’t and doesn’t want any of his people to suffer under the weight of sin, which is why he gave all the instructions he did through Moses, and why he sent the Son to conquer death and offer salvation for all who believe. He knows what the world is going to throw at us and he knows how very weak we are to resist the call of Self. He knows that his strength is greater than the world or ourselves, and will help us if we will only ask, and follow him. So we need these words as much as Moses’ flock of stubborn Hebrew children. We need to internalize this message of our ONE God. We need to dedicate ourselves to him alone, to teach our children how to walk in his ways, and we need to make his Word a part of our everyday lives. We need to do this so we can stay away from the death that comes with following our own way. In my life I was greatly blessed by others teaching these things to me as I grew up. My parents were tantamount in this, but there were countless others in the churches we attended over the years who instructed and encouraged me in God’s way. I am forever in their debt, as they showed me what it looks like to live out these words and incorporate them into daily life. For me right now, I am working on putting God’s command into my heart through personal Bible study, through prayer, and through thinking of God’s Word throughout my day. That may entail posting a verse where I can see it, reading about Christian life, listening to songs, or discussing Scripture with others. I also have the privilege of teaching children and students through church, which I find to be one of the richest blessings in my life. Something happens when I am responsible to teach someone else about God’s Word– there is a sense of accountability, of urgency, of humility and grace, of awe over a young identity being formed, and of appreciation for the things I was taught. I pray that God will keep me from dropping the ball, and that his grace will cover any errors I may make (have made) in my imperfect attempts. This passage provides life-long aspiration, inspiration, and motivation for the child of God. Thank you, Lord, for making me a part of your family because of your Son, and for sending your Spirit to guide me in obedience to your Word. This is going to be a mini-post. I am currently in the middle of a local service project “camp” with our church’s middle schoolers and am still not good at preparing posts in advance, so I’ve stolen a few moments to write now. And it is actually because of the kindness and goodness of a fellow believer that I can have this time… she drove my team of students to the pool so I could get to an appointment I couldn’t miss, and it just made sense to eat supper at home before heading back. Having this list of attributes committed to memory helps me SO much. 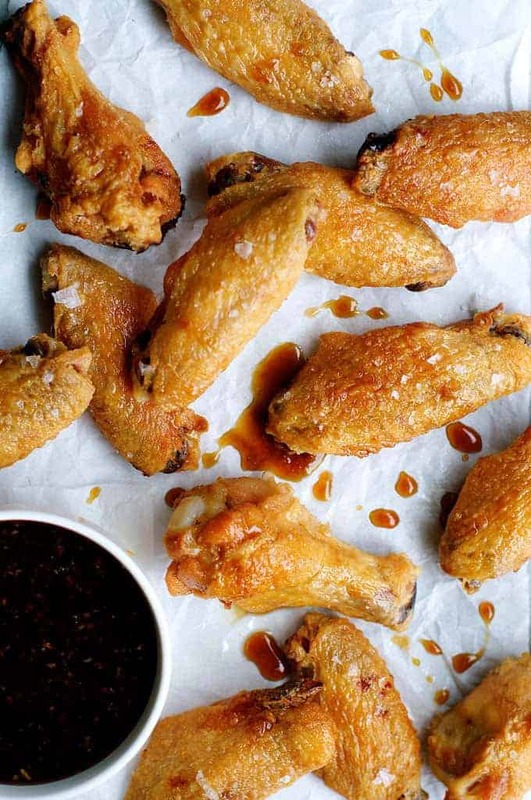 I have found that the Spirit brings to mind this list, or just specific parts of it, when I am faced with temptation. There are often times when what I want conflicts with what God wants for me, but ultimately I want to walk by the Spirit and become more like God, and because the Spirit dwells with me in my mind, He knows just when to contrast my selfishness with His attributes. For example, if I would be tempted to gossip I might find myself thinking of kindness instead. If I feel like complaining I may remember patience or self-control. If I feel like lashing out the Spirit may prompt me onto the path of peace. I’m not saying it always happens, or that I always choose the Spirit’s way. I have failed many times! But I have also been a recipient of gracious guidance many times. Hiding this part of God’s Word in our hearts, meditating on their meaning, and practicing them in our lives will lead to a growth of the fruit we display! Something I learned at some point in my college years (I think? I wish I could remember) was that this list from Galatians 5:22-23 is not a list of fruitS (plural), but fruit (singular). As cute as it is to present children with colorful images of peace as a banana and joy as a pineapple, which is how it seems most of us learn this list, the original language is actually pointing us toward one thing. 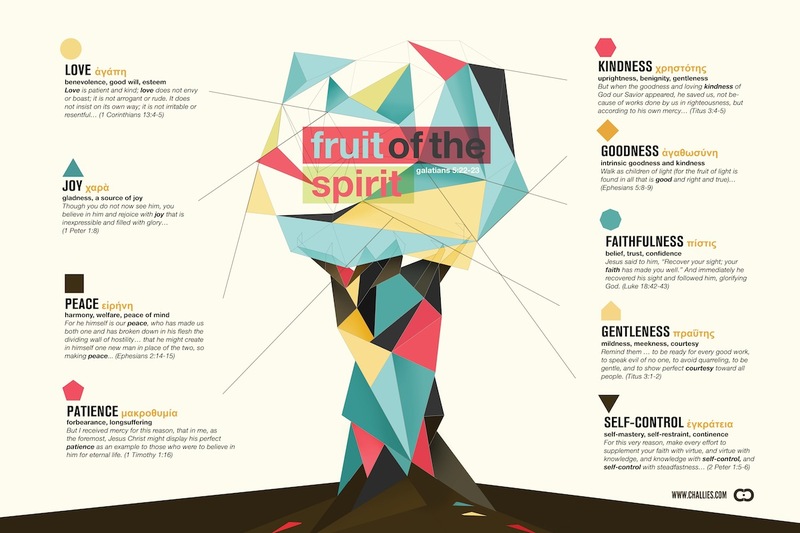 I found the image below and loved that the fruit of the Spirit was represented as a multi-colored but singular shape. I hope you will enjoy the image, and find yourself producing fruit as you walk by the Spirit and allow him to work in your life! 11 And this is the testimony, that God gave us eternal life, and this life is in his Son.12 Whoever has the Son has life; whoever does not have the Son of God does not have life. These verses contain powerful truths that are central to the Christian faith. We believe that Jesus is who he said he is, and therefore the things he said are to become our testimony, lived out in our words and actions. I believe that turning from sin and trusting in Jesus Christ is the only way to be reconciled to God, and that life with God’s Holy Spirit leads the follower to walk in truth, and the follower’s earthly life will “end” with being brought into God’s presence in heaven. This is the gospel, and this the testimony I’m trying to live out. I want to live a godly life, but I am so lacking in so many areas. I thank God for graciously giving me what is required to walk in the way of life, and pray that I will desire his truth more and more as I go. I need it! A Christian life well lived has been on my mind for the past couple of days, as I am mourning with my family the death of one of my great-aunts, who passed away peacefully at the age of 94. The las time I saw her we spent many happy moments together and told her I loved her. Because I really, really do. I’m sad because I don’t get to see her anymore when I visit my extended family, but I’m glad she is at rest in the presence of the Lord. Indulge me; this post is going to be pretty nostalgic. But the blessing my Auntie and the rest of my “greats” have provided in my life is more than stories or presents or even family love and support. From these older women and men, especially the ones I’ve come to know well, their faith is the biggest and best blessing they could give me. They were some of the first older people I ever knew. What a privilege it is to be loved by someone who is already halfway down life’s road (or further!) when you step onto it, someone who has walked with the Lord and learned how to trust and obey. Not that my greats are perfect people– I think they would be the first to tell you that they are not. But when I think of them, and specifically of my Auntie Barb right now, I see what can happen when we live a life connected to God through Christ and walk in step with the Spirit. I am so glad I got to know my auntie and benefit from the wisdom, maturity, and fruit of the Spirit that God brought forth in her life as she followed Him. Here’s what I’m getting from my verses of the week: to know someone who walks with The Way (Christ) is a gift. Today, this week, and for the rest of my life I want to remember that I am not the sole beneficiary of the gifts God gives to me like faith, forgiveness, love, strength, peace, and more. I want to remember that as I follow The Way I may be (should be) blessing those around me, instructing them, and encouraging them to be connected to God through Christ. That is the legacy I want to leave, not for the sake of my own name, but for the sake of others and for the sake of God’s great name– he is the one who made us, loves us, and provided a way to be with him in spite of our sin. May the name of the Lord be great in me and may I return to these verses and the rest of the Word for the wisdom to live this life well. The joy of heaven will also be motivating me this week as I think of my dear sweet auntie in God’s very presence, unencumbered by her earthly form and enjoying her Savior. I look forward to seeing her there when I am called to receive my own undeserved reward. This week I’m focusing on two related verses, sung together as track 2 on “Seeds of Character.” The song is called “The Wages and The Gift,” and combines Romans 3:23 and 6:23. I’ll paste them both below in the NIV. These verses are very popular for memorization and for sharing the Gospel, and with good reason. They clearly state some of the basic truths about the Christian faith, and are easy enough to understand for those who are seeking answers about God. These verses are part of the good old “Romans Road” witnessing tool, and if you’re a fan of Google image (as I am!) you can find a fun bunny trail of great and not-so-great tracts from years gone by on there. Outdated graphics aside, these verses from Romans are timeless, true, and always useful in the life of a Christ-follower. God’s Holy Spirit has been using these words for centuries to point out our need for God and his gracious gift of life to his children. Because Romans 3:23 is a little clause from the middle of a longer sentence (although with Paul they’re always longer sentences), and because both verses begin with “for,” I went ahead and re-familiarized myself with chapters 3 and 6 in their entirety. I had considered splitting these verses up across two weeks, but after reading both chapters decided against it. The ideas in each verse complement one another really well. Looking at both verses in context helped me with ideas for application, so I’ll paste the natural habitat of each verse below. But I highly recommend reading Romans 3 and Romans 6 (only around 50 verses total) to see what the Spirit has for YOU! 21 But now apart from the law the righteousness of God has been made known, to which the Law and the Prophets testify.22 This righteousness is given through faith in Jesus Christ to all who believe. There is no difference between Jew and Gentile, 23 for all have sinned and fall short of the glory of God, 24 and all are justified freely by his grace through the redemption that came by Christ Jesus. 25 God presented Christ as a sacrifice of atonement, through the shedding of his blood—to be received by faith. He did this to demonstrate his righteousness, because in his forbearance he had left the sins committed beforehand unpunished— 26 he did it to demonstrate his righteousness at the present time, so as to be just and the one who justifies those who have faith in Jesus. 15 What then? Shall we sin because we are not under the law but under grace? By no means! 16 Don’t you know that when you offer yourselves to someone as obedient slaves, you are slaves of the one you obey—whether you are slaves to sin,which leads to death, or to obedience, which leads to righteousness? 17 But thanks be to God that, though you used to be slaves to sin, you have come to obey from your heart the pattern of teaching that has now claimed your allegiance. 18 You have been set free from sin and have become slaves to righteousness. 19 I am using an example from everyday life because of your human limitations. Just as you used to offer yourselves as slaves to impurity and to ever-increasing wickedness, so now offer yourselves as slaves to righteousness leading to holiness.20 When you were slaves to sin, you were free from the control of righteousness. 21 What benefit did you reap at that time from the things you are now ashamed of? Those things result in death! 22 But now that you have been set free from sin and have become slaves of God, the benefit you reap leads to holiness, and the result is eternal life.23 For the wages of sin is death, but the gift of God is eternal life in Christ Jesus our Lord. Amazing stuff! So much truth! In my own life I want to do a little bit of re-association with these verses. They bring up such a strong picture of “witnessing” to me that when I hear them I don’t really think of my own need, and that’s a problem. I will always need these words in my own heart and mind even though I have already accepted God’s free gift of eternal life. These verses do not provide us with a “one and done” lesson, but give ongoing guidance (through the Holy Spirit) as we strive to live our lives pushing sin away and reaching out for God. I need to keep coming back to these words, because part of my heart keeps trying to go back to its old sinful ways (or “enslaving” itself to sin as seen in Romans 6). I didn’t just need these verses at the moment of my salvation, but I need them every hour. I need them to renew my mind, and I need them to change my actions. May these words keep me from usurping judgment that belongs to God. May these words keep me on the path of righteousness in moments seen by others, and moments seen only by God. May these words remind me that I must continue receiving grace rather than relying on my own effort to produce righteousness. May these words draw me back to the one who saved my life. May these words in my life do more than I could ever imagine! As always, I would love to hear your thoughts about these verses and ideas.